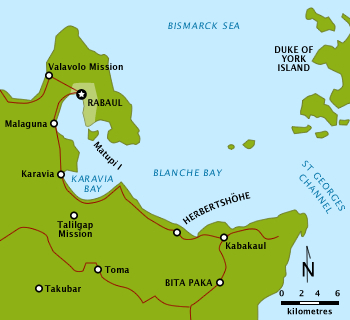 Similar to New Zealand’s operation against German Samoa in August, the main target of the operation was a strategically important wireless station—one of several used by the German East Asiatic Squadron—which the Australians believed to be located in the area. The powerful German naval fleet threatened British interests and its elimination was an early priority of the British and Australian governments during the war. 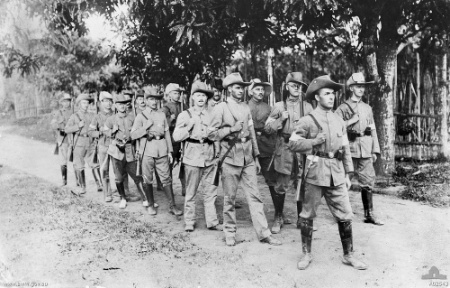 After an unopposed landing, a mixed force of German reservists and half-trained Melanesian police mounted a stout resistance and forced the Australians to fight their way to the objective. After a day of fighting during which both sides suffered casualties, Australian forces captured the wireless station at Bita Paka. The battle was Australia’s first major military engagement of the war and the only significant action of the campaign; in its aftermath the remaining German forces on New Britain fled inland to Toma. 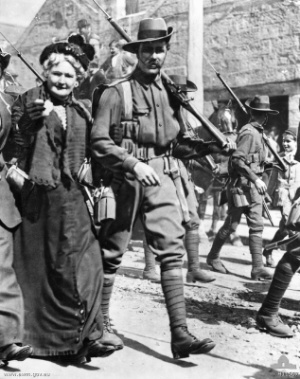 Following a brief siege, the German garrison capitulated, ending resistance to the Australian occupation of the island.